Bowling Green State University tennis standout Christine Chiricosta has been named to the 2011 Capital One Academic All-America® Women’s At-Large Team, it was announced Thursday (June 9). Chiricosta, who has earned Academic All-America® honors for the third year in a row, is the first-ever women's tennis student-athlete to be named to the first team. Chiricosta earns the first-team honor after being named to the second team as a junior and the third team in her sophomore year. As a sophomore, she became the first player in BGSU tennis history to be named to the Academic All-America® Team. Chiricosta, a native of Avon Lake, Ohio (Avon Lake HS), is very likely the most decorated player in BGSU tennis history. On the court, she finished her career holding all three school records for wins. Chiricosta had a total of 178 combined career victories, with 89 singles and 89 doubles wins. In the 2010-11 campaign, she was named to the All-Mid-American Conference First Team for the second-straight season, after earning all-conference second-team honors in each of her first two years at BGSU. In '10-11, Chiricosta had an overall mark of 50-20, having played at the number-one flight in both singles and doubles. That 50-win total tied her for fifth place on the BGSU single-season wins list. The team co-captain had identical marks of 25-10 in both singles and doubles on the season. Her singles win total was fifth on the BG single-season list, and the doubles win total deadlocked her for fifth on that school chart. Chiricosta has amassed a veritable plethora of hardware off the court as well as on. Earlier this spring, she earned the BGSU Department of Athletics Medal of Honor. The Medal of Honor is the highest award given by the athletics department, and is given to one male and one female who encompass everything that a BGSU student-athlete should be. One year earlier, she had been named BGSU’s Junior Scholar-Athlete of the Year. Chiricosta was named to the Academic All-MAC Team in each of her three years of eligibility for the honor, and was selected as a ITA Scholar Athlete in each of her first three seasons at BGSU. The ITA Scholar Athlete awards have not yet been announced for 2010-11. On the court, in addition to earning All-MAC First-Team honors, Chiricosta shared the conference’s Leann Grimes Davidge Sportsmanship Award in her senior season. 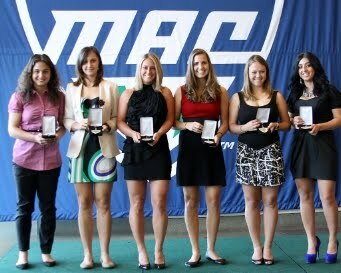 That award, which is the result of voting by the MAC women’s tennis student-athletes, is presented to the player or players who displayed outstanding sportsmanship in MAC competition. Chiricosta was named the MAC’s Scholar-Athlete of the Week twice in her senior year and five times in her Falcon career. Chiricosta, as mentioned the lone player in program history to earn Academic All-America® honors even once, helped BGSU to a total of 55 dual-match wins during her career, tying the school record for a four-year span. She became the school’s career leader in overall individual wins on Jan. 30, 2011, picking up a come-from-behind singles win at Butler. Then, on Feb. 27 at Detroit, she picked up her record-breaking singles win. Chiricosta snapped the BGSU career doubles wins record on April 2, teaming up with sophomore Maddy Eccleston for a victory against Ball State. Chiricosta’s academic all-district award in 2009 had made her the first Falcon tennis student-athlete so honored in six years (since Alyson Gabel in 2003), and she has earned that honor in each of the last three seasons. In the classroom, Chiricosta maintained a perfect 4.00 cumulative grade-point average as an adolescent/young adult/secondary education major. The Capital One Academic All-America® Team process began at the district level, as eight all-district teams were chosen as the result of voting by the College Sports Information Directors of America (CoSIDA) members within those respective districts. Chiricosta was named to the all-district first-team for District 4 for the third-straight spring. That district consists of schools in the states of Ohio, Michigan, Kentucky, Tennessee and Alabama. To qualify for nomination, a student-athlete must be a starter or important reserve with legitimate athletic credentials and a cumulative grade point average of at least 3.30 (on a 4.0 scale). Additionally, she must have reached sophomore athletic and academic standing (true freshmen, redshirt freshmen and ineligible athletic transfers are not eligible) and must have completed at least one full academic year at the institution. The at-large team hopefuls consisted of student-athletes in the women’s sports of bowling, crew, fencing, field hockey, golf, gymnastics, ice hockey, lacrosse, rifle, skiing, swimming, tennis and water polo. The names of the first-team selections to each of the Capital One Academic All-District® teams each were placed on the Capital One Academic All-America® Team ballot. The tennis Falcons concluded the 2010-11 season with 15 wins, just one shy of the school record, and finished three spots higher than predicted in the MAC standings. BGSU finished the campaign with a dual-match record of 15-8 and a MAC ledger of 5-3. The Falcons, picked to place seventh in the MAC in the preseason coaches poll, actually finished fourth before advancing to the semifinal round of the MAC Championships. Senior gymnast Kayla Hoffman of NCAA champion Alabama and senior golfer Marianne Andersson of Florida Southern College headline the 2011 Capital One Academic All-America® Women’s At-Large Teams, as selected by the College Sports Information Directors of America (CoSIDA). A pair of tennis players, seniors Christine Chiricosta of Bowling Green an native of Avon Lake and Claire Clarke of Louisiana Monroe, earned first team honors after being named to the second team last year. Senior skier Eva Huckova of Utah and senior gymnast Maddie Pearsall of Cornell were also members of the second team last year who earned spots on the first team this year. In fact, at one time a few summers ago, Sheila and Christine and Sheila and Christine’s brother Matt (a law student at CSU’s Marshall Law School) were ranked the No. 1 mother/daughter doubles team and No. 1 mother/son team, nationally. They were the first to have that No 1 ranking in both categories simultaneously. Christine’s younger sister Nikki will be a sophomore at Bee Gee and aiming to re-re-write the tennis record books Christine just got done re-writing the past four years. first team pick, she won the MAC’s Sportsmanship Award in 2011. The two-time MAC Scholar-Athlete of the Year, the Avon Lake, Ohio native compiled a 50-20 record as a senior while leading the Falcons to a 15-8 record. Hoffman led the Crimson Tide to the national championship here in Cleveland at the Wolstein Center two months ago. Hoffman and Andersson have been chosen as the winners of the Academic All-America® of the Year award in the University and College Divisions, respectively. The Women’s At-Large program for Academic All-America® includes the sports of bowling, crew, fencing, field hockey, golf, gymnastics, ice hockey, lacrosse, skiing, swimming and diving, tennis and water polo. A Human Development and Family Studies major with a perfect 4.00 G.P.A., Hoffman capped off her brilliant career by leading Alabama to its fifth NCAA gymnastics championship in April. A five-time All-American, Hoffman became the first student-athlete to be named as the Southeastern Conference Gymnast of the Year and the SEC Gymnastics Scholar/Athlete of the Year in the same season. The winner of the 2011 Honda Award, presented to the national collegiate gymnast of the year, the Union, N.J. native led Alabama to the national title with a 9.95 score on vault, a 9.925 on bars and a 9.95 on floor exercise. She earned first team All-American honors in all three events. Named as the NCAA Central Region Gymnast of the Year, she won the vault, bars, floor and all-around titles at the NCAA Regional Meet. During the 2011 season, she won 29 event titles and scored 9.90 or better 30 times. The recipient of post-graduate scholarships from the NCAA and the SEC, Hoffman won 55 event titles in her career and posted 78 scores of 9.90 or better. In her four-year career, she helped Alabama reach the national championship meet four times. In addition to leading the Crimson Tide to the 2011 championship, she was also part of an Alabama team that finished second in her sophomore year and third place as a junior. She was also honored as the winner of the Paul W. Bryant Female Student-Athlete of the Year Award, presented to the most outstanding male and female student-athletes at the University of Alabama.